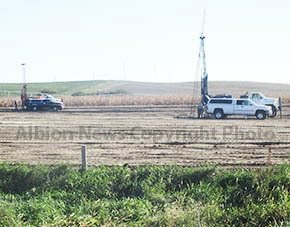 Land leveling and test well drilling were underway last week at the site of the new mill and grain storage facility for Pillen Milling, LLC northwest of Albion. Final soil compaction tests were taken last week. Goal is to have the facility completed by late 2016 or early 2017, according to Jeff Hienrich, a company spokesman.